Japanese woodblock print, Ukiyo-e, is one of the most significant influences on Impressionism and further developments of Western art. When Japan began international trading after 200 years of isolationist foreign policy in the mid 19th Century, ukiyo-e reached Western Europe with a great impact. Its features of flatness, dynamic composition and clear outline shook many artists such as Monet, van Gogh, Pissarro, Lautrec and Degas. I envy the Japanese the extreme clarity that everything in their work has. It’s never dull, and never appears to be done too hastily. Their work is as simple as breathing, and they do a figure with a few confident strokes with the same ease as if it was as simple as buttoning your waistcoat. 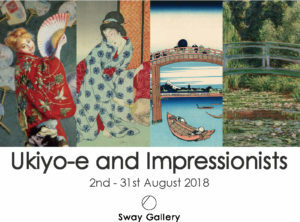 This exhibition includes original works of Hokusai, Hiroshige, and Utamaro, whose works were collected by many Western artists. Along with examples of Impressionist paintings, we will closely look into the relationship between them.